This Interview with Saw Be--- detail his concerns from Thaton Township, Thaton District, during the period between February and April 2016, including information on the stone mining and cement factory project near Maw Lay Cliff. Saw Be--- conveys villagers’ concerns that the stone mining and cement factory project that the Phyu Min Tun Company wants to implement on Maw Lay Cliff will result in land confiscation, destroy plantations, pollute the environment, and disrupt villagers’ livelihoods. Consultations between the Phyu Min Tin Company, local villagers and district leaders occurred in A--- village and B--- village. 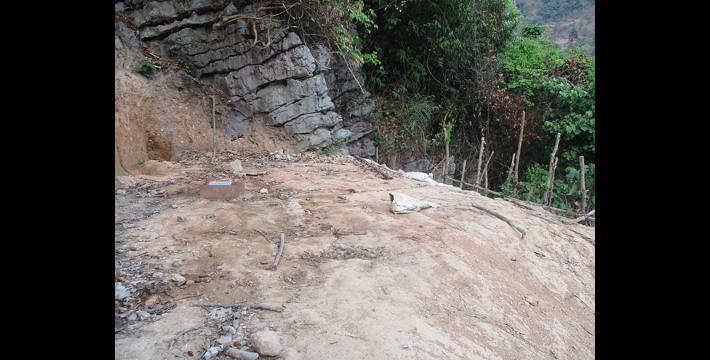 Though villagers expressed their worries and said they did not want the company to implement their project, the company began their project on Maw Lay Cliff anyway. In response to the stone mining and cement factory project, villagers formed four groups and sent complaint letters to different levels of government. They also applied for land grants from the Karen National Union (KNU) to protect themselves against land confiscation. However, villagers have not received any response about their complaints and not all villagers who applied for land grants got one. The following Interview was conducted by a community member trained by KHRG to monitor local human rights conditions. It was conducted in Thaton Township, Thaton District on April 18th 2016 and is presented below translated exactly as it was received, save for minor edits for clarity and security. This interview was received along with other information from Thaton District, including four other interviews and 9 videos. [Interview begins abruptly] What is the project that is being conducted? It is stone testing for producing cement. When did the project begin to be carried out? They [the company] came to ask permission from the villagers in 2013. Karen National Liberation Army’s [KNLA] Lieutenant Ee Tha also came and held a meeting once in B--- [village] and two or three times in A--- [village]. When was it [the meeting]? It was in 2013 and 2014. How many times have they [the company/Lieutenant Ee Tha] met with villagers? As far as I know, they met with A--- villagers once. Lieutenant Ee Tha came once [to meet with villagers]. Who is Lieutenant Ee Tha? He is [KNLA] Adjutant General in Brigade #1 [Thaton District]. He came to hold the meeting with the villagers in B--- village. Some villagers went to attend the meeting but some villagers did not. What did he come to talk about? He came to discuss the Maw Lay Cliff [stone mining and cement project] and to get the villagers’ opinion as to whether they agreed with the project or not. How many villages did he hold the meeting with? He held the meeting with all of the villagers in the whole village tract. However, some villagers from some villages did not come to attend the meeting due to being busy with their work. No villagers from Maw Lay village came to attend the meeting at that time. The second time he held the meeting it was in B--- village. He also held meetings in A--- village many times and people from [KNU] township office joined the meeting. Later [after these meetings] it was decided that the company could not conduct the [stone mining for cement] project. The village head suggested that they [the company] meet with upper leaders. Which side of [the government are] the upper leaders [from]? Do you mean that they [the company] came to the district level [to discuss and conduct the stone mining project] and the district level leaders did not allow them? They [the company] came directly to the village [to conduct the project]. As there was conflict [among the villagers], they did not have a chance to conduct [the project]. Therefore, they tried to meet with the top leaders. Then, Manager Min Thu, who is implementing the cement factory project, came into the village. Who will come to test [the stones] for the cement factory? Lieutenant Chit Thu from Battalion #2 and Karen National Union [KNU] township leader then came [into Maw Lay village]. The villagers then thought that things would be fine, as the leaders came to meet with them [to listen to their concerns]. Before the leaders came into the village, a villager predicted, however, that, “The project will be implemented even though the villagers disagree,” after the company had had a meeting with them. She is a member of the Women’s Organisation in D--- village. Later the company came to test [the stone] to produce cement from the cliff. And the villagers were complaining. What did they complain [about]? They complained that they [the company] entered onto their paddy fields and they did not inform the villagers in advance. They [the company] then addressed the problem with the village head [by paying compensation]. The villagers also took the compensation that they were paid. Some plants in some villagers’ plantations were destroyed but they did not complain about this. They [the company] tried to test [the stone for mining] on March 2016. On April 16th or 18th 2016, they started to test [started the project]. Do you know the director of the company? I heard from people that the company is supported by people from Germany, and that one Singaporean is also involved. Do you know who gave the company permission to conduct the project? I do not know who gave the company permission. The company said that they were given the opportunity by the Ministry of Mines [Myanmar Ministry of Natural Resources and Environmental Conservation]. Did the KNU give the company permission? No, the KNU did not give them permission. They [the company] approached the KNU and the KNU informed them that they would not object [to the project] if they [the company] get the villagers’ consent. What is the location of the project that is going to be implemented? They are going to set up six sites to conduct the stone [mining project]. In which village is this [Maw Lay] cliff [stone mining project] located? There are Ner Hpaw Hta and Htee Hpoh Htoo villages to the west of the cliff; there is P’Nweh Klah village to the east of the cliff; there are Tha Waw La Hkaw and Maw Lay and Noh Htoh Day villages at the bottom of the cliff. How many acres [of land] have the company set aside to conduct the project? I do not know how many acres they have set aside to conduct the project. I also heard from one of the company’s rich men that if they cannot produce cement here, they are going to take [the stones] to a place further away. Did he talk about this in the meeting? Yes, he talked about this when he met with the villagers in the meeting. In the past, he did not talk about this in the meeting. When he first met with the villagers, he only said they would construct a road, build a clinic and pay money to the villages. He did not talk about anything related to the advantages and disadvantages [of conducting the stone mining project]. However, one KNU leader reminded the villagers to be thoughtful [critical] in case [the project] might cause the destruction of villagers’ properties [plantations]. The villagers thought that they would get money if the project is implemented, so they signed [their approval]. Have the villagers got money now? We formed a group and we explained to the villagers about the advantages and disadvantages [if the project is implemented]. Many of the villagers then objected the project. Do you think they are going to carry on conducting the project? As I see it, the company owner has his own house, [he] rents an office and they [the company] signed a [rental] contract for two or six years. Since it has cost a lot already to implement the project, I think they might carry on conducting the project. They said that a hydraulic drilling machine that they bought cost hundreds of millions [estimate] of kyats. People said that there are six or seven sites that they are going to conduct [stone mining on]. Each site is going to be mined down 120 feet deep. They take the stones and put them in crates. Some of the stone crates were sent to the town and some stone crates were kept with them. They then tested the stones [which were kept in the crates] with machines. Were you allowed to visit [their mining sites]? In the past, the villagers were working on paddy fields near the cliff, built houses with trees from the cliff, and got some vegetables and roots for medicines from the cliff. They depended on the cliff for their daily living. Now, there is no water in the paddy fields so there is difficulty for farming. There is also difficulty for fishing, since they put chemicals in the water. [In the past], they [villagers] planted chili at the bottom of the cliff. The paddy also grew very well. They also paid respect to the cliff. 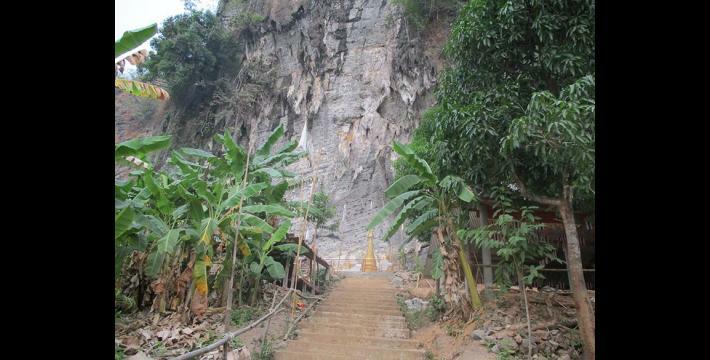 Some villagers took stone from Maw Lay Cliff when they went to work in Bangkok [because it has special significance]. 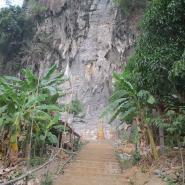 There is also pagoda built by a hermit on the cliff. How many pagodas are built on the cliff? There are four pagodas built on the cliff. How many acres of the villagers’ land will be confiscated or sold? The company proposed [to take] about 200 acres of lands at both the east and west parts of the cliff. I think [they will take] more than 200 acres. The whole cliff is about 937 acres [wide]. How much [money] does the company pay per acre of land? They have never said anything in terms of paying compensation. If their testing [examination of stones] is successful, they will continue working on their project. If they get the land near the cliff, they will do [the project] near here and if they do not get the land near here, they will do [the project] in a place further away. I heard that they are going to move their [project] place to the forest reserve. Where is the forest reserve? It is to the west of Maw Lay Cliff. How many acres and how many villagers’ lands do you think will be destroyed if the project is implemented? There is about a thousand [acres of land] that will be destroyed. No one will be able to live near the project site. The farms which are at the bottom of the cliff will not be able to be farmed as stones will fall over the farms. Some villagers said that they will not move even though they are asked to move. However, some of those [who do not own any land] might think that they would get 1,000,000 kyat [US $733.68] free if they were given [compensation]. What is the percentage of villagers who agree and disagree, do you think? Before the villagers knew the advantages and disadvantages [if the project is implemented], villagers who do not live near the cliff signed [the document] as they thought they were going to get 1,000,000 kyat [US $733.68] for free soon. When they [the company] first came to hold meetings with the villages, before the villagers knew anything [about the project], they said that each person [from each house] would get 1,000,000 kyat [US $733.68] if they agreed on the project. Many villagers went to the meeting and signed [the agreement]. They [the company] did not say anything in relation to pros and cons [of the project]. Later, most of the villagers who live in the west of the cliff, which is about 400 households, objected to the project. How many households agreed and disagreed [on the project]? On this side [of the cliff, villagers] did not sign [the document]. Only the other side [villages at the eastern part of the cliff] signed [the document], as they live far from the cliff and do not know [the negative consequences of the project]; they thought that they will get money for free. As the villagers later came to know the advantages and disadvantages [of implementing the project], most of them then objected [to the project]. Some villagers whose children went to work as day labourers in their [company’s] mining project and those who rent their houses or trucks to the company agree on the project [to be implemented]. Do the villagers’ lands that are near the cliff have [land] grants? Villagers paid 20,000 or 30,000 kyat [US $14.67 or US $22.01] to the officer [of the land records department] to get grants. However, only some villagers got the grants; some villagers did not get the grants from the [Burma/Myanmar] government side. The villagers heard that the project would be implemented so they also made [prepared] grants for their lands in order to get confirmation from the KNU side [in order to protect their lands]. In which year did the KNU produce [land] grants for them? Has the [stone] testing finished? 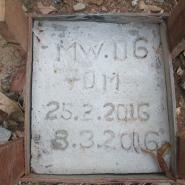 The [stone] testing finished in March 2016, as mentioned before, and [the company] already went back [left the testing site] and took their machines back as well. Was there any change to the water or environment after the [stone] testing? As I know, there is less water compared to the past, as they use water [from the river] both day and night. The stones fell onto the villagers’ land. They also made the [road] way for their truck on Hpah Tee [uncle] Ta Kway’s plantation but he did not complain about it. A company member together with a local villager named Aung Chit tried to cut down the bamboos in MuhGar [aunt] K---’s plantation. She said that she told him [company member], “You came to conduct the project. But, you also came to work in my plantation without letting me know.” She also went to complain to the company staff and Hpah Tee Aung Chit. What did the [company] staff say in reply? They did not say anything. However, he/she might think that that woman has messed up [caused a problem for the company staff by complaining]. Muh Gar K--- also told me, “We hid from the KNU [protecting the KNU/KNLA by not reporting their whereabouts to Tatmadaw] in the conflict time. After the ceasefire, they [KNU] do not help us to protect Maw Lay cliff.” She sees the KNU like that. Is there any other environmental destruction [due to the project]? 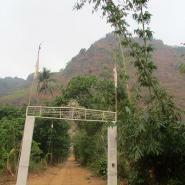 At the western part [of the mountain], they [the company] worked on the villagers’ plantations. The villagers complained and the village head addressed the problem [by] talking with the company. The company then paid compensation to villagers. On the other side [of the cliff], they [the company] stopped [redirected] the water [river that irrigated the rice paddies] as they needed their trucks to cross to the other side of the river. Therefore, the paddies [did not have enough water so they] were not growing well and so the villagers now do not have enough rice. 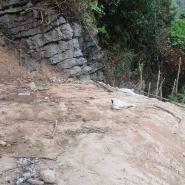 The company also cut down trees and bamboo at the project site. However, there was not much [environmental] destruction. Is there anything [action taken], like, the villagers gathering together and reporting to the upper leaders about the project? The villagers formed [four groups]: Group #1 which includes [villages] which are at the bottom of F--- cliff; Group #2 which includes B--- and G--- [villages]; Group #3 which includes Lah Hkoh village; Group #4 which includes Ma Cha village tract. When I went to visit them, I asked their opinion on the project. As they thought that there might be destruction [of their plantations], they did not want to agree on the project. They said that they were given [compensation of] 300,000 kyats [US $220.10] [per house] without knowing anything. Now, if the villagers are called to attend the meeting regarding the cliff, they do not want to attend anymore as they also need to work [for their livelihood]. Some villagers worried that the project will be implemented, so they also wrote a complaint letter. Who did they report the complaint letter to? The villagers formed a committee and they said that they were going to send [complaint letters] to the Burma/Myanmar president’s office, KNU district and township level [departments] and KNU headquarters. Was there any change after submitting the complaints? 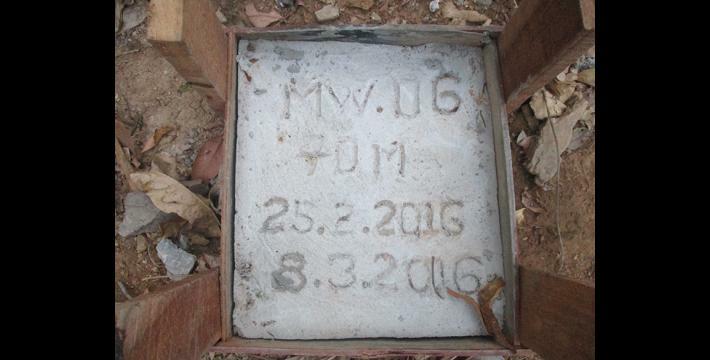 Did the Myanmar government or KNU government come to the area to ask about the project? There is no one who has come to the area after [villagers] submitted the complaint. After submitting the complaints, the company still stays in the area and has repaired their houses. Therefore, we are worried that the project may be implemented. What is the villagers’ opinion on the project? If they come to live [in the area], there will be a higher population, more motorbikes or cars. Some older people do not like it [being populated]. Some people said that only the road has been built and we [already] cannot sleep at night time as it is noisy. 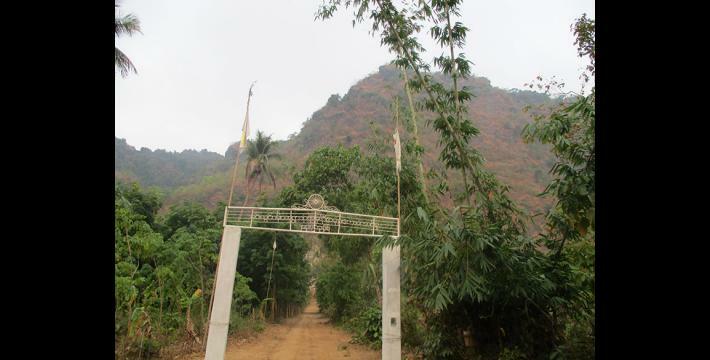 Some women said that if the cement factory is built, there would be no KNLA bases and they [the KNLA] would be driven out [of the area] because the Tatmadaw would come and build their camp. That is their opinion. What do the villagers want [the project to be]? The villagers will be very happy if the project is not implemented. They would be much happier if the [KNU] leaders came to tell them that the project had been stopped. What more do you want to add regarding the cliff? If there is no environmental destruction, and there is development for the villages, and it brings benefit for the villagers, we will agree to not only this cement factory [project] but also any projects to be carried out. However, I personally do not agree with this cement factory [project]. I personally object [to the project]. If they [our objections] are not successful and the project is allowed to be carried out, I will not stay in the village anymore. I will go to work in Thailand. One more thing that I would like to say is that we have formed a committee to [try to] suspend the project. The state level leaders and KNU leaders also help us to stop the project. We, the villagers, will try to stop the project. We will also be happy if both sides of leaders [KNU and Burma/Myanmar government] help us to oppose the project. However, we worry that we will not be able to make them [the company] suspend the project. There are many other cliffs which they can do [mine] such as Lay Hpoh and A--- Loo cliffs. I think it is the best if they do not touch and conduct [mining] in Maw Lay Cliff. That is all. The Karen National Liberation Army is the armed wing of the Karen National Union (KNU) which is the main Karen group opposing the government. For more information on this company, see, “Thaton Situation Update: Thaton Township, April 2014,” KHRG, January 2015, “Residents call on KNU to scrap contentious cement factory plans,” Karen News, June 2017. The Karen National Union (KNU) is the main Karen group opposing the government. All conversion estimates for the kyat in this report are based on the October 4th 2017 official market rate of 1363 kyat to US $1.